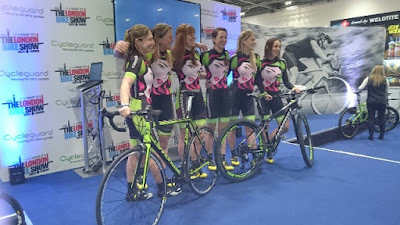 I managed to get down to the London Bike Show a couple of weekends ago and had the privilege of seeing two women's team launches on the Friday and Saturday. 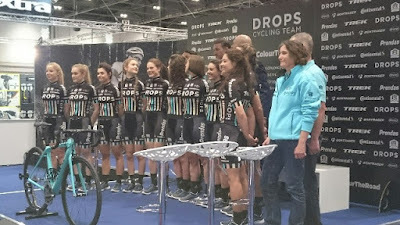 Friday saw the launch of Drops CC, a new UCI registered team headed by Bob Varney, with mentoring from the hugely successful national racer, Karla Boddy. I am impressed to see her move into a mentoring/Director Sportive role, particularly as I recall her racing some of the races in the old London Women's Cycle Racing League less than 5 years ago. 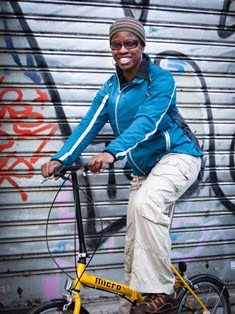 With riders such as Caribbean Road Race Champion Tamiko Butler, and National Masters Road Race Champion, Laura Massey the team hopes to make its mark in the National Series Races and the National Championships, as well as in some of the races in Europe. The team hopes to get a wildcard entry for the Aviva Women's Tour (now part of the inaugural Women's World Tour series it accepts entries primarily from top tier UCI women's teams). All the ladies are currently finalising their training in Mallorca, but when they leave the island I look forward to seeing the women making their mark at the early season classic continental races - Le Samyn des Dames, Dwars door Vlaanderen, and Grand Prix de Dottignies, as well as races over here like the Women's Tour of Yorkshire, the Cheshire Classic. On Saturday afternoon we were treated to the eye-catching kit of the newly formed Cannondale Girls racing team (aka We Ride Green). Again, this team has a lot of familiar racers that I have seen riding on local circuits in London and at the Notts/Derby Cyclo cross and the Northwest Cyclo cross leagues. In fact a number of the girls are from the former Mule Bar Girls racing team. Cannondale Girls seem to have retained the same spirit of fun while racing hard. In fact the big reveal included generous amounts of Prosecco as well as delicious cookies and cakes baked by the girls themselves. Moving swiftly on from their kitchen talents Natalie, Adele, Diane, and Maxine talked to me about their plans for the coming season. Plans are quite varied within the team due to the diversity of disciplines Cannondale Girls pursue. Unlike Drops CC who are focusing on the road, Cannondale Girls will be mixing in quite a lot of off-road activities - Enduro, Downhill and Cross country mountain biking, as well as cyclo cross - and also mountain bike orienteering. A rather alternative way of cycle racing, and Natalie was very excitedly looking forward to a season of doing this with team-mate Emily Benham, the 2015 World Mountain Bike Orienteering series winner in this exciting discipline. It'll be very exciting to see how this group of "Wonderwomen" get on in 2016. In fact you can catch up with some of the team members at Cannock Chase trail centre on 20th March during their Bike Demo weekend. Although both of these teams, have a slightly different slant in terms of their racing, they share equal amounts of motivation and energy. Furthermore, what I admire about them is that most of the racers are not full time athletes. They have professional jobs or studies, and family commitments - some with children, while one (Phoebe Sneddon) is currently pregnant! But yet they are so disciplined and hungry to succeed that they manage to juggle all other aspects of their lives with their racing and still manage to take home silverware. And that gets my full admiration.